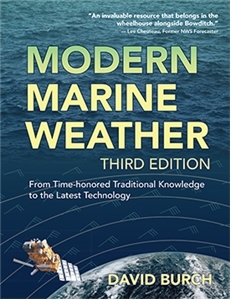 A new, comprehensive text on how to take weather into account for the planning and navigation of voyages, local or global, using the latest technologies as well as the time-honored skills of maritime tradition, so that your time on the water remains as safe and efficient as possible. Fully updated and expanded in this new 3rd edition. It does not just tell you about it; it tells you how to do it. 8.5" x 11" paperback, 274 pages, 400 illustrations, Full Color. A tremendous amount of the modern part of marine weather has changed in the past five years, which, with the addition of color, and all the benefits that brings, makes this a major update to the previous edition. We have greatly expanded the use of GRIB formatted forecasts, including overlays on weather maps and other images. High resolution rapid refresh models now make it possible to forecast local winds in digital format, which has a potentially revolutionary impact on day sailing in local waters—it’s not just for ocean passages any longer. An overview of optimum weather routing has been added, along with expanded discussion of ASCAT scatterometer winds, which are now readily available in GRIB format. We have emphasized obtaining weather data by email, including crucial details of the process. Now, with accurate barometers in our cellphones, the benefit of careful pressure analysis is more readily available, and has been stressed. The crucial practice of forecast management (map sequencing) has been improved, and new means of squall forecasting using the new simulated radar reflectivity forecasts have been added. The entire book has been gone over to optimize descriptions, with major updates in several sections. Used by many of the top sailing schools and professional academies. A USCG recommended text for deck license exam preparation.